When I was a kid, I had these molded plastic figures of classic Universal movie monsters. I’m sure they were cheap, the sort of thing I could nag my mother into buying me on a visit to what passed for a department store in our town. They didn’t bend or seem designed for the invention of new stories; they just stood there frozen to their bases and called up memories of the movies which first brought them to life. I loved them. Yet, I’m pretty sure I hadn’t seen even one of those movies by the age of five or six: The Wolfman, Frankenstein, Dracula, Creature from the Black Lagoon. There was no cable or Turner Classic Movies. Home video wasn’t available yet. And our local TV stations offered only lesser fare in their broadcasts. But I knew their stories just the same. It’s as if some frequencies in the background noise of pop culture linger forever, permeating the collective American consciousness and turning up in references and reflections all over the place. We don’t have to go to the source to feel some connection with their recurring themes — The Great Depression, Mae West, Joseph McCarthy, the Gettysburg Address, The Beatles — their echoes surround us and become an integral part of our impressions of the world. I guess it was that way with these monsters. I’d run my fingers over their surprisingly fine details and feel that I knew them. That was great fun during all the afternoons I’d spend by myself in the basement. But come nighttime, their images became a bit frightening. So I played a game with myself. I took the story playing in my head — the one in which the monsters broke out of my closet and found me helpless in bed — and reshaped it into something more pleasant. To my delight (and my surprise even today), the strategy worked. These large and powerful creatures — misunderstood and unappreciated — would instead come out of my closet to embrace me, to hold me in their powerful arms and to protect me from whatever threatened me in the night or during days filled with violent classmates and mean-spirited teachers. Their secret inner lives, their fears and longing were my secret, too. I stopped being afraid. Reshaping those pieces of pop cultural narrative to fit my own needs was a clever remedy, if I do say so myself. But it’s hardly exceptional. It’s a recognition that our western pop culture is a conversation and not just a broadcast. And, as a conversation, it allows us to pick from it those pieces that suit our needs, remake them and (ideally) send them back out into the world to continue the thread. So much of creative culture is a matter of riffing on the stories that are already out there, be they high-cultural references (the Bible, the Tale of Genji) or low (comic books, TV perfume ads of the 1970s). At their simplest, these riffs offer an easy way to reference a whole collection of ideas and attributes without having to develop them yourself. But a more gifted artist may connect with that background material in deeply personal ways, creating works of great beauty from the flotsam they skim off the cultural pond. Best of all, by holding up to our attention source material we might have stopped seeing (because it’s so familiar that it’s become virtually invisible to us) or might just have dismissed (because we regard it as only pulp or kitsch not worth our consideration), the artist makes us reconsider its importance. We may begin to see that source material in a new light; maybe even recognize in it something just as worthy of our affection as the reinterpretation which brought us back to it. We may begin to see pieces of the world around us as something new and strangely wonderful. Daniel Johnston is an artist for whom certain pieces of the popular cultural landscape are deeply affecting. He was clearly touched early in life by the works of important popular artists, like The Beatles and the comic book illustrator and story-teller, Jack Kirby. His own work is popular in both its style and forms: he writes pop music — short, melodic songs with a deliberately crafted hook or clever turn of phrase — and creates visual work in common media like marker, pencil and highlighter. Johnston’s work is infused with references to that larger pop conversation that helped shape his own sensibilities. And that seems less by a deliberate choice of style than because it’s through the lens of the pop work he loves that he’s come to understand the world around him. These works inform his music and his visual art because they inform his perception of the world at large. Johnston’s battle with bipolar disorder has sometimes overshadowed his notoriety as an artist. He’s been labeled a Naif and an Outsider for the apparent simplicity of his vision and his presentation. But the act of breathing in simple elements from the pop cultural atmosphere and exhaling tightly structured, deeply personal and (just by the way) infectious pop tunes is neither naive nor outside the tradition of what artists have done for millennia. His struggle with bipolar disorder (detailed lovingly, but painfully in the 2004 documentary The Devil and Daniel Johnston ) has only helped to shift the focus away from the beauty of his work and onto the quirkiness of his personal vision. 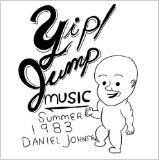 On his 1983 album, Yip/Jump Music , Daniel Johnston features a song entitled “The Creature.” As you can probably guess from this long build-up, it’s about the Creature from the Black Lagoon … sort of. Johnston portrays himself in both his music and his drawings in many guises. His awkwardness around women seems to have helped him to feel outside of the social mainstream. And that point of view has given him a very tender affection for those monsters whose outward appearances have separated them from the connections they long to make — Frankenstein, King Kong, the Creature. This song seems to come from some place deep and personal. Its vague story line suggests something that may have occurred in Johnston’s own life. But it all holds together without his getting too specific about those details because he builds his song on the story we already know, that of the Creature. His take on that story, however, isn’t the standard. His tenderness in describing the monster’s feelings seems to come from personal experience. And I’m still paying the bill. Once you allow him into your head and heart, you’ll see that all those quirky traits make his music only more affecting. It’s no wonder his zealous supporters have included other musicians, like Kurt Cobain, Jad Fair, Thurston Moore and Kim Gordon; some pretty good song writers in their own right. Johnston has taken the Creature’s story and presented it so as to emphasize an emotional component the movie buries almost too deep for us to notice. He shifts seamlessly from the first-person declaration of that opening lyric into a third-person apology for the maligned and misunderstood monster and then back again. The Creature’s panting through his gills. Can’t you see the pleading in his eye? Just don’t ask him why. The part of the story that Johnston finds most important is certainly there in the movie; it’s just treated with less care than the same theme in movies like King Kong (1933) and Frankenstein (1931). 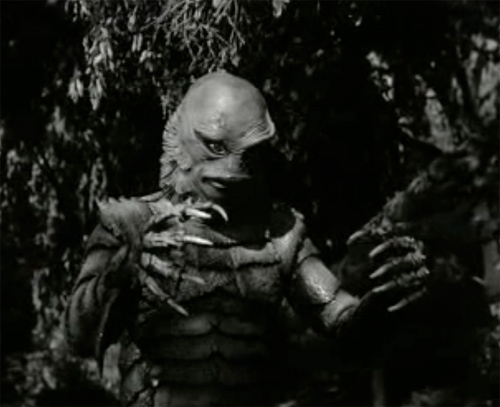 In superficial ways, Creature from the Black Lagoon (1954) seems to fit comfortably among the science fiction and horror output of the decade. While most of those movies were tinged with references to the dangers of either the nuclear age or Communist infiltration, you could read this as more straight-forward: mean-spirited and inhuman creature kills people. And taking our cues simply from the editing and incidental music, that would seem a reasonable interpretation. But Johnston emphasizes the other story here: that of unrequited love and the violence we inflict on outsiders. All of that is certainly in this story. But the movie treats those complexities without much care and allows them to get buried under suspenseful music and the terrified expressions of bit players. Just mixing up the shots and swapping the incidental music for something more romantic coaxes out a rather different story from those same pieces. There’s a genius in seeing through the glossy finish of pop cultural artifacts to their core; in being able to discern where there’s substance and where there’s nothing inside. But Daniel Johnston’s real genius is in taking the culture around him to heart. He makes it part of a sincere and deeply felt view of the world. And feeling so deeply these pieces of story and bits of visual reference, he’s able to build with them something that’s at once very personal and entirely accessible to anyone who’s swimming along side him in this ocean of popular culture. Listening to his music, I can hear him suggest specific details of his life and personal history. But I can also hear the voice of that monster in my bedroom closet, the one who finally emerged to be my friend and protector. Who could ask for anything more from one man’s art? * The image of “Weird Love is Cool” is from the wonderful volume, Daniel Johnston with essays by Phillipe Vergne, Jad Fair and Harvey Pekar. (2009, Rizzoli). This entry was posted on Saturday, April 3rd, 2010 at 9:13 pm	and is filed under Books, Cultural Leitmotifs, Heroes, Monsters, Movies, Music, Reflections. You can follow any responses to this entry through the RSS 2.0 feed. You can leave a response, or trackback from your own site.